Triposo Blog: 1.6 coming up! During the Jamboree we spent a lot of time on making a new version of our App and we've just uploaded it to the Appstore. We'll launch the new version for Android soon as well, so in a week or so the whole world can enjoy Triposo 1.6. As always there are lots of small improvements, fresher content and better suggestions to name just two, but also a few bigger ones. Since you are probably most interested in those let's have a look at them. When you open up the guide of a destination you are actually in, you will find a new button. Whoa! Click it and you get an overview of all the places around you ordered by distance. What's interesting to notice is that this list contains both points of interest we have detailed information on, as well as places that we don't know very well. When you hit on a place we don't have a good description for, you can immediately add you own content to it. The next step in many cases will be to check in. Our checkin functionality works offline and check ins can be published to Facebook (but it's not necessary). 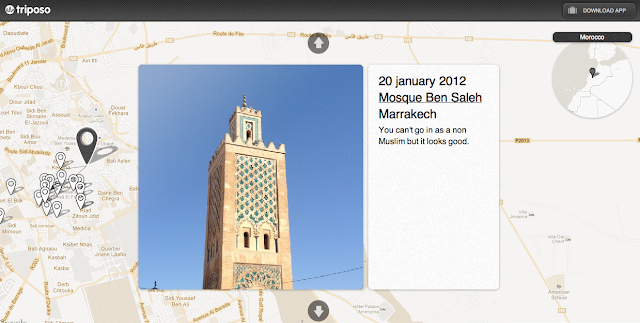 Check ins also show up on your travel log. Now that you can give your fellow travelers the low down on all the places around you, you probably want to add a few places no one has ever heard of as well. The good news is: you can! There is a plus button (another new button!) which opens a little wizard. We review all the things you add, and where possible we try to feed them back into the appropriate sources to help out great open content projects like Wikitravel, OpenStreetMap or ChefMoz. Finally, we've launched the travel log website. All the check ins you do in the app, end up here on our website - even the checkins you did with the old version. We present all your checkins on the map, and you can navigate them easily. Some events coming up and we can use the above application to acknowledge the detail of these events. Its my pleasure to come this site and before it i don't have idea about it. However, I want cheap essay writing and at the same time i like to download this application and use according to above mentioned direction. And look at this - https://speedypaper.com/rate-my-paper-online. These are the games you possibly can leave your children to play and not worry that they will have nightmares when the enjoying is long over. The web games are fun and useful to such growing minds and they make fantastic options to others. The games are categorized to make it straightforward for players to choose those they are most serious about and those that they are sure to have fun playing. I learnt something new from this post,Hope you also learnt of the new site for quality papers! وکیل های با سابقه ی مستر دادیار، هر کدام تجربیاتی دارند که می تواند کمک بخش حل پرونده های سخت و حتی سریعتر و کم هزینه تر شدن تمام پرونده ها (چه پرونده های سنگین و چه سبک) گردد. لذا می توانید از خانواده ی بزرگ وکلای مستر دادیار استفاده کنید.